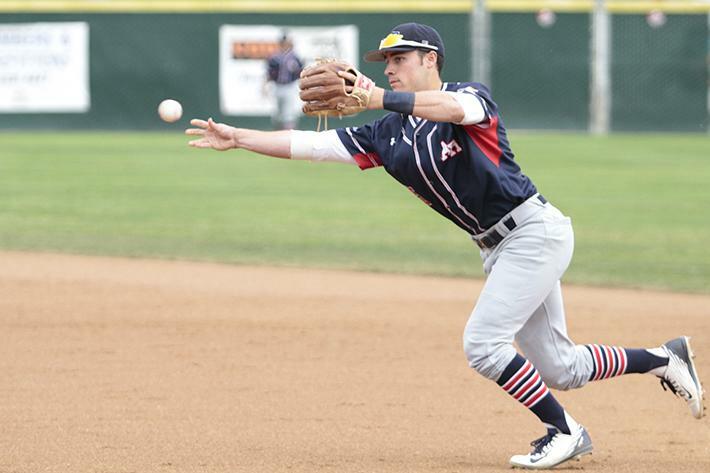 American River College shortstop Cameron Bennett catches the ball before knocking out Sac City's Tyler Houlihan during ARC's win over Sac City. A triple and quick reflexes by right fielder Alex Gaskin and an eighth inning RBI single by designated hitter Dalton Devries helped American River College’s baseball team win its seventh straight road game Tuesday, defeating Sacramento City College 2-1 in the team’s first conference game of the season and the first of a three game series against Sac City this week. ARC has won three of its last four games even though its offense has struggled to put runs on the board the last two weeks. 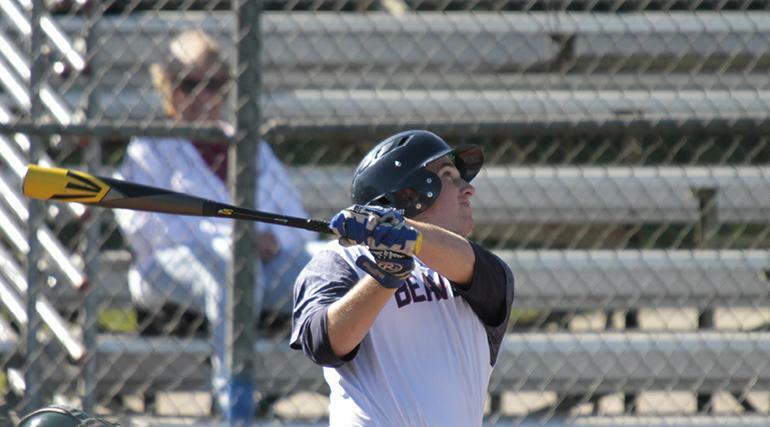 Devries went 3-4 at the plate with one RBI, the only ARC player to manage more than one hit in the game. ARC starting pitcher Matt Gunter was solid again, allowing one run and scattering four hits over seven innings of work. Gunter (5-1) walked five and had four strikeouts in the win. ARC head coach Doug Jumelet kept his feelings on the game short and sweet. “We won. It was good,” he said. ARC (9-7 overall, 1-0 conference) is more than one game above .500 for the first time this season and improved to third place in the Big 8 Conference with the victory. Sac City starter Ben Ritchey got through the first inning easily against ARC’s lineup, giving up two singles to Devries and third baseman Colton Freeman in the second, and didn’t allow another baserunner until Gaskin’s triple. Gaskin smashed the ball to left-center field to lead off the seventh, sprinting for third base after rounding second and beating the cut off throw by Sac City shortstop Anthony Fellman. Gaskin scored on a wild pitch by Ritchey, who suddenly faltered after breezing through the lineup the previous four innings. Ritchey recorded two outs, allowed ARC to load the bases and was removed from the game for relief pitcher Travis Magness, who got center fielder Brandon Raposa to fly out to end the inning. In the eighth, with shortstop Steven Mercado on third base and Gaskin on second, Devries ripped a two-out single to left to easily score Mercado and give ARC a 2-1 lead. Gaskin was thrown out at the plate attempting to score by Sac City left fielder Alex Muzzi. Relief pitcher Christian Savage took the mound in Gunter’s place in the bottom frame, and went three-up, three-down. Mike Marlar came in for the save in the ninth, and got it after Fellman grounded out to first base. The two team’s will square off twice more this week, tomorrow at ARC’s Beaver Field at 2:30 p.m. and Saturday at Sac City at 1 p.m.
Jumelet declined to make players available for interviews after the game. Be the first to comment on "ARC extends road winning streak to seven with come from behind win at Sac City"